We were up at 5:30, left at 6;30, stopped to say goodbye to tia Ana, and arrived at the rental car place shortly after 7:00. Strangely, the guy that was supposed to be there to give us a lift to the airport didn’t show up, so we just dropped the rental car key in their mailbox and took a taxi to the airport, no big deal. But Ana did say she was going to call the owner and ask him what kind of rinky-dink operation he was running. “What do you mean?” asked Ana. “That’s impossible!” Ana exclaimed. She pulled out all our documents - the flight confirmation said April 10th, our Madeira rental car was for April 10th, our apartment was for April 10th, everything said April 10th. “We are definitely booked for the flight on April 10th, what’s going on?” She asked. We’ve done a fair bit of traveling, and continue to make rookie mistakes, but I think this is the first time we went to an airport on the wrong day! Ana was totally embarrassed. We asked how much it was going to cost to change the flight, and we were looking at over 500 euro so we tucked our tails behind our legs, walked over to where Pedro and tio Manuel were waiting to send us off, and explained to stunned faces how we got the date wrong. We taxi’d back to the rental car place, got our key back from the staffer there who said, “Well, this was good training for tomorrow’s actual departure.” Ana was feeling bummed out, but then we realized that we had just gained a BONUS DAY in the Azores, and since it was going to be beautiful and clear outside, we could get in a beach day! We returned to tio Manuel’s house and the kids and Ana had short nap while I pounded out a few journals (I usually try to write every day, but the days here have been packed with activity so I’ve done very little writing). 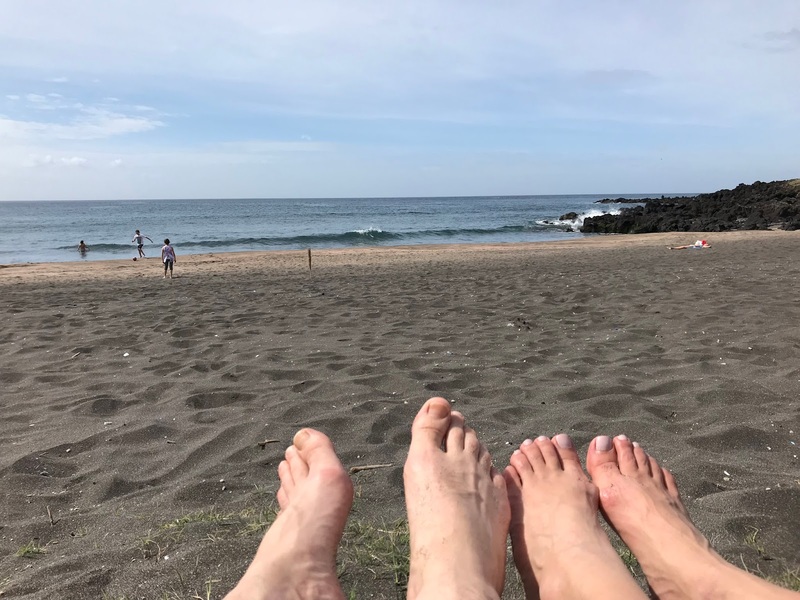 At 10:30 we went for a long walk that ended up at the Praia Populo and we plopped ourselves in the sand and soaked up the beautiful sunshine. The kids had borrowed a ball from the cousins and were playing soccer on the beach. As I was watching, I saw Magnus wind up and boot the ball as far as he could into the ocean. I don’t know exactly what his plan was to retrieve it, as he was wearing jeans, but the two of them stood there scratching their heads as the ball was pulled by the falling tide straight out to sea. Magnus was on the beach trying to talk a local dude in swim trunks into swimming out to retrieve the ball, which was now at least 100 metres out. The guy wasn’t going for it. Magnus came over and tried in vain to explain how he accidentally hoofed the ball out into the ocean, but nobody was going for it. We agreed this was the second disaster of the day, and that the ball was probably going to end up getting stuck in a sperm whale’s blow hole and suffocating him until he finally blew it a hundred feet into the air. This was actually the third disaster of the day, as during our walk down Stella had to pee so badly she was nearly in tears, and Magnus kept making her laugh, so she had to run to the beach restaurant to avoid wazzing her pants. After I went for a refreshing ocean swim, we walked up to the beach restaurant for a late lunch and a cold drink. Magnus ordered the most expensive hamburger on the menu and proclaimed it to be the best burger he’s ever eaten in his life. I ordered the pork plate, which arrived as several slabs of thin pork steaks topped with an easy-over egg and fries, all on a gigantic plate that only half fit onto the small plastic table, already occupied by other plates and glasses. Well I took my fork and knife and began slicing into that delicious stack of meat when my plate turned over, and the easy-over egg flipped easily over and onto my jeans and shirt, leaving thick strings of yellow yolk all over my freshly laundered clothes. “Cleanup on aisle 2!” I said. “Going to need a crotch swab over here!” I tried to carefully mop it up, but those damn non-absorbent European table napkins (that seem to be made primarily of recycled plastic) just mashed it into my clothes and made a worse mess. “There’s your disaster for the day Dad!” said Stella, laughing. 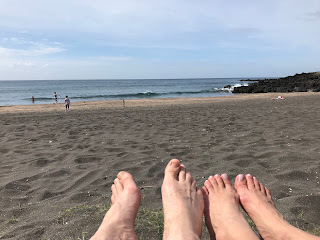 The rest of the day was spent at tio Manuel’s house hanging out, visiting, watching a bit of tv, saying goodbye to our amazing Azores family, and enjoying the last few hours of time we had on this, our favourite of islands. Azores 2018 : Day 13 - Man this place is hilly!